WASHINGTON - The U.S.-Ukraine Business Council (USUBC), an association devoted to enhancing trade and investment relations between the two countries, has reached its goal of having 100 member-companies by the end of 2008. And that member is the world's leading developer and producer of computer operating systems and programs - the Microsoft Corp.
That announcement was made here on December 17 by Morgan Williams, at a luncheon during the USUBC's annual meeting in Washington. The meeting also re-elected Mr. Williams as the group's president and CEO. The USUBC is the largest Ukrainian business related trade association outside of Ukraine. Since its founding in 1995 it has promoted the strengthening of U.S.-Ukraine bilateral cooperation in business, trade and investment. Microsoft, the creator of the Windows computer operating system and Office program that now dominate the world’s personal computers, now joins with other U.S. corporations in that effort, among them such well-known companies as Boeing, Coca-Cola, General Dynamics, Halliburton, Kraft Foods, Lockheed Martin, Northrop Grumman, Pratt & Whitney – Paton, Proctor and Gamble and 3M, as well as many smaller less-recognizable companies and such non-commercial institutions as the Kennan Institute, Woodrow Wilson International Center for Scholars, the U.S.-Ukraine Foundation and the Ukrainian American Bar Association, among others. Ukraine, with more than 150 employees dealing primarily with intellectual property issues. Ms. Dwoskin, in her brief remarks, added that Microsoft is also trying to help Ukraine develop its local computer economy. 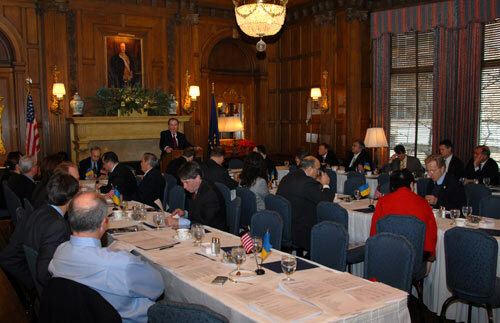 The luncheon, attended by representatives of USUBC member-organizations and diplomatic and other representatives of the two countries, also heard greetings addressed to the organization from high U.S. and Ukrainian officials, as well as analyses of the current world economic crisis and its ramifications in Ukraine by representatives of the International Monetary Fund and a Washington think-tank. practices” in Ukraine. “I ask you to lead by example and help us to move forward in Ukraine,” she said in her message, read by Ron Slim of TD International. and called on them to continue to do so by supporting Ukrainian health, education, cultural and arts organizations. “This is particularly necessary now, as the less fortunate sections of our society particularly feel the brunt of the world and national financial crisis,” she noted. 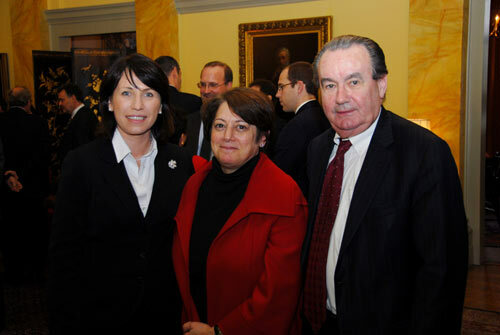 Like Ms. Pazarbasioglu, Mr. Aslund also saw a possible positive result from this crisis for Ukraine. Despite the “tremendous blow” of the 25 percent loss of its steel exports and the massive GDP drop in November, he said, this crisis could move Ukraine to get it right by developing other industries, moving more toward manufacturing and becoming more diversified, and by turning from the Russian market toward Europe. “This could turn Ukraine much more into a middle-class society and less an oligarchic society,” he stated. LINK: The Ukrainian Weekly, Editor-in-chief: Roma Hadzewycz, staff@ukrweekly, www.ukrweekly.com, two photographs are shown.